I think it's safe to say that I love food just about as much as I love sports, especially skiing, running and triathlon (if I had to pick three). So when I heard about a new event that combined food and sport in one weekend--and in January, no less, when I'm always yearning to get out of the Windy City and take some turns in the mountains--my mouth started to water. OK, you caught me. Skiing or not, it also helped that I remembered my experience at the Keystone Culinary Festival where my taste buds were satiated with gourmet goodies that I probably wouldn't order off a menu, but was so glad to have them forced upon me. I had to get my ticket's worth, after all, and that meant trying everything on tap at the March event. Good thing I skied all day. But if I could mimic that experience again, I'd try to drop everything to do it. Yes, it was that good. And I have a feeling that the Beaver Creek Food & Wine Festival, slated for January 26-28, 2012, could easily match those expectations. It's the first of its kind at the Colorado resort. It's full of locally and nationally renowned chefs. It's skiing and food--what's better than that? Beaver Creek lives up to its slogan, "Not Exactly Roughing It." But that's usually reserved for its pristine skiing, luxury lodging and on-premise dining like the infamous Beano's Cabin and Spago at The Ritz-Carlton Bachelor Gulch, to name a few. Come January, skiers and foodies, or a combination of the two, will find a little piece of heaven waiting for them at the bottom of the mountain, except it's not in the form of the mountain's delicious chocolate chip cookies. The resort recently teamed up with the FOOD & WINE brand--you might recognize it as the name of an epicurean magazine--to offer a three-day winter culinary celebration on the slopes. John Besh, who recently served as a guest judge on Bravo's Top Chef, is executive chef and co-owner of the Besh Restaurant Group out of New Orleans. Tim Love is chef and owner of The Lonesome Dove Western Bistro and The Love Shack in Forth Worth, Texas. Marc Murphy, who serves as a judge on The Food Network's Chopped, is executive chef and owner of three New York City restaurants. Stephanie Izard, who won the fourth season of Bravo's Top Chef and was the show's first--and as of Dec. 2011, only--female winner (spin-offs not included), is the chef and partner of Girl & the Goat in Chicago, a huge favorite among locals. Food for thought: Izard cooked up amazing pork ribs at her Chicago hot-spot in November. My mind is still reeling and I'd run a marathon just to eat those again (and it wasn't even a full slab). Lachlan Mackinnon Patterson is the chef and owner of Frasca Food and Wine in Boulder. Richard Sandoval is the chef and owner of Richard Sandoval Restaurant Group, operating 26 restaurants. This star-studded cast of locally and nationally renowned chefs, plus sommelier and journalist Anthony Giglio, will be producing a culinary extravaganza with events hosted at a variety of restaurants throughout Beaver Creek, including the host hotel, the Park Hyatt Resort and Spa. Events range from apres-ski to First Tracks on the slopes to exclusive dinners. Other events include the Meet the Chefs Reception kicking things off on Thursday, the Guided Snowshoe and Luncheon, wine seminars, cooking classes, and Saturday evening's Grand Tasting (and if that's anything like the one at Keystone, you're in for a treat). Tickets and lodging specials range in price for this exciting weekend in the mountains. 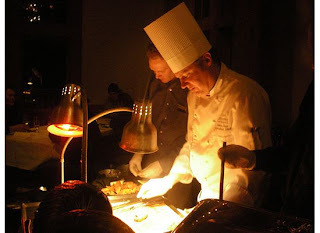 For all the details, from the events to chef biographies, check out www.beavercreek.com/foodandwine.